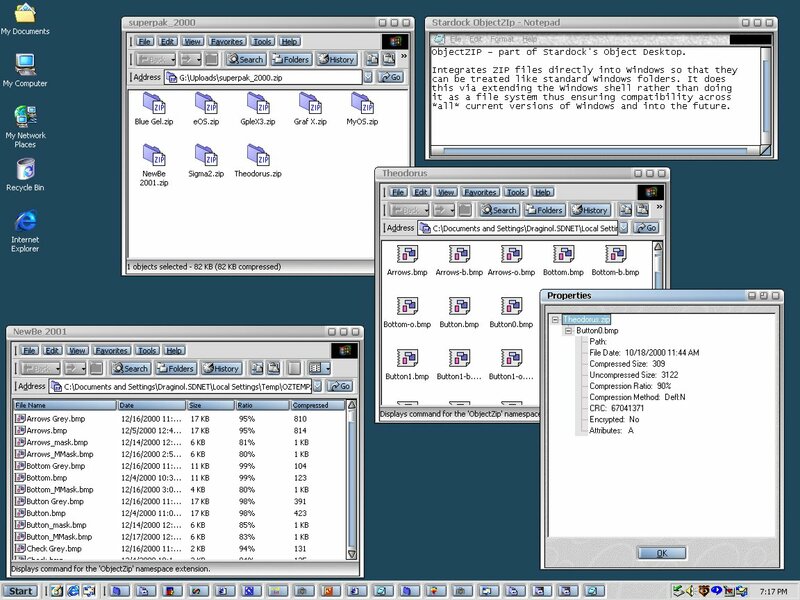 Archive files are presented and treated like a folder to provide a common metaphor with other uses of Explorer on your system. 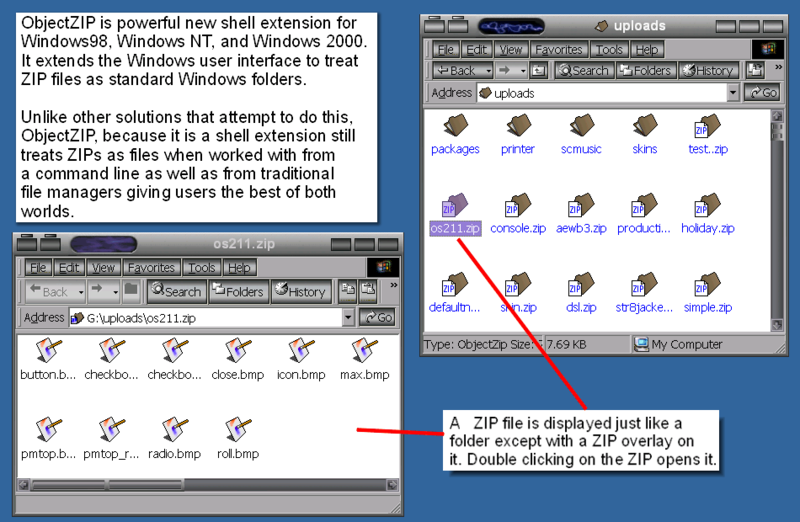 View, sort, and manipulate the contents of ZIP files like regular Windows folders. Integrated into Explorer to reduce the overhead of a standalone app and to help ensure compatibility with "new" versions of Windows. Works on Windows 98, ME, 2000, and the forthcoming Windows XP. Right mouse button menus in Explorer provide quick and convenient access to ZIP functions without having to launch another application. Save time and money by reducing the size of file attachments sent via email by compressing with ObjectZip. Multiple compression levels to optimize for size vs. speed depending on your needs. Includes an integrated download handler to grab ZIP files from the Internet and continue browsing (doesn't grab your browser window). Download zip files to specific location defined by the user. No more scattering ZIP downloads all over the machine, they can all be set to save to a common location. Open ZIP files immediately on download, no need to open a separate program to manipulate them. Create self-extracting ZIP files for easy distribution of large or multiple files to someone who does not have a ZIP program. CAB and RAR extract support for popular formats (you may occasionally receive files of these archive types and ObjectZip will allow you to extract their contents). Checkout functions to create a folder with the ZIP contents for evaluation. Execute setup programs directly from ZIP files. Extensible plugin support for adding new formats. Fully featured console utility for archive functions (create, extract, and more from the command line). Object Zip is only available as part of Object Desktop and is not sold seperately.